The following is a guest post from one of my fellow volunteers from the 2015 Women’s World Cup. She and I randomly started talking one day, a conversation which led me to interviewing her for our volunteer newsletter. It was during the interview I learned of her experiences being a female footballer living in London, and I (of course) just had to ask her if she’d be interested in sharing here. So happy she was and now has. The more stories female players share, the better off the sport will become. Time to vote for the FIFA Women’s World Cup Canada 2015 goal of the tournament. FIFA has compiled a list of 12 candidates from which to choose your favorite. Since my two favorites didn’t make this list, my vote went to Ange N’Guessan for her power floater vs Norway. Which goal is your pick? You have until Monday July 13 10:00am (CET) to submit your selection. This just popped into my inbox so I thought I’d share. If someone manages to get a ticket, please take pictures! This Friday at 11 a.m., Mayor de Blasio and the City of New York will host a ticker tape parade in honor of the U.S. Women’s Soccer team and their World Cup championship win. Everyone is welcome to join in the celebrations along the Canyon of Heroes, but we’re also giving away tickets to a special ceremony at City Hall immediately after the parade. Get more information on the parade and sign up for your chance to attend the ceremony by visiting the page linked below or by calling 311 — we’ll only be accepting signups between 2 p.m. and 4 p.m. ET today. Space is limited at the post-parade ceremony — attendees will be selected by random drawing after 4 p.m. today and alerted via email or phone starting at 10:30 a.m. tomorrow. Whether or not you can join the ceremony, we encourage you to wear red, white, and blue and come out to celebrate in the Canyon of Heroes (Broadway between the Battery and City Hall) and honor our World Cup Champions. Looking forward to celebrating on Friday! 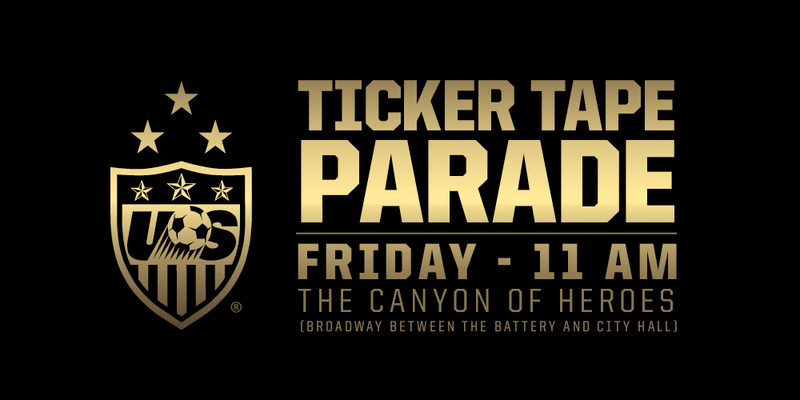 NYC to Host Ticker Tape Parade for the USWNT – 2015 Women’s World Cup Champs! I AM SO EXCITED! The parade route passes my office, so I’ve canceled my 11 AM meeting and I will be downstairs to cheer our champions on. If you’re in or around NYC, please come down and give our women the support they so richly deserve. USA! USA! USA! USA! 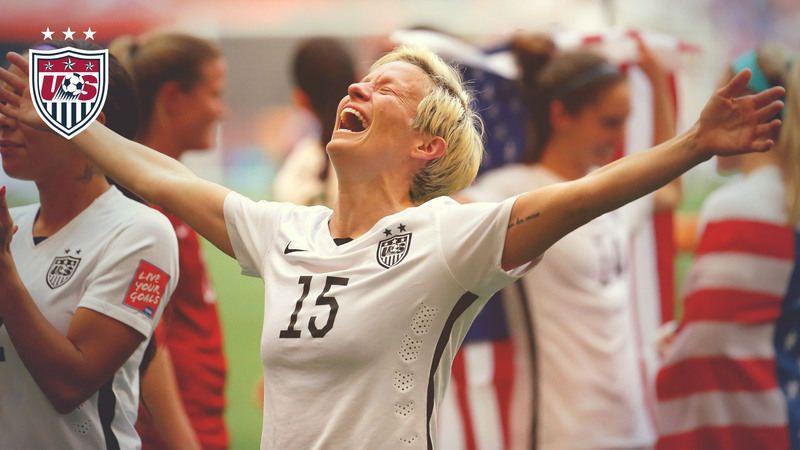 CHICAGO (July 7, 2015) – The City of New York will host a ticker tape parade for the 2015 FIFA Women’s World Cup Champion U.S. Women’s National Team on Friday, July 10 at 11 a.m. ET. All fans are invited to celebrate along the parade route which will be the Canyon of Heroes, along Broadway from the Battery to City Hall. A special program will be held at City Hall following the parade, and fans can visit nyc.gov/parade for a chance to attend. The parade will honor the USA following its historic run at the 2015 FIFA Women’s World Cup that culminated with a 5-2 victory against Japan on July 5 to give the country its third title, and become the only nation to achieve that feat. We claim no credit for any images or videos posted on this site unless stated otherwise. This blog is not affiliated with Real Madrid & we make no profit from the content posted here. If there is any content appearing on this blog belonging to you that you do not wish to appear on this site, please email us (hbandshbreak [a t] gmail [ d o t] com) and it will be removed promptly. Categories Select Category Bits and Bobs Deeply Confusing Die Mannschaft News For Shame! Game Day Gallivanting HB & HB Glossary HB & HB Introduction HB & HB Manifesto International Duty Isn’t It Bromantic? Oh Honey No Oh No She Did Not Spanish National Team News The Daily Drool Uncategorized Wa-tish! Corner Wa-tishista News Flash Watishista Correspondents Women’s World Cup 2015 World Cup 2014 World Cup 2018 You Can’t Handle The Truth Yum. Just Yum.